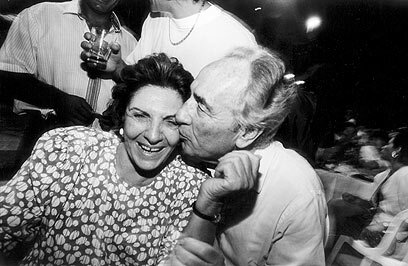 President Shimon Peres's wife Sonya died Thursday in her Tel Aviv home at the age of 87. She apparently suffered a cardiac arrest during her sleep. A Magen David Adom doctor pronounced her dead. At around 12 pm, Peres's driver Alon phoned Sonya's house to inquire after her. Her grandson answered the phone and said his grandmother was asleep. Following the call he decided to check on her and only then discovered she had died in her sleep. Upon word of his wife's death the president left his Jerusalem residence and headed towards their joint home in northern Tel Aviv. He entered her room alone and kissed her goodbye. Defense Minister Ehud Barak said: "Sonya was a very special person. She was a symbol of modesty, simplicity and humanism." 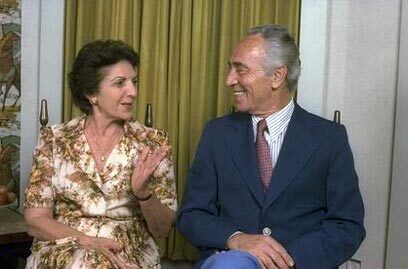 Professor Rafi Valden, Peres's son-in-law said, "Our dear Sonya was a wonderful wife, mother and grandmother. The epitome of love, grace and noble spirit. " Sonya Peres was born in Poland in 1923 and made aliyah in 1927 with her family. Her father worked as a carpenter and teacher. She met Shimon Peres at the Ben Shemen Youth Village. Unlike most of her classmates, after graduating from school she enlisted in the British army in 1942. She served as a nurse and was stationed at a hospital in Egypt together with some 100 nurses from Israel. After one year she was sent to a driving course and went on to serve as a truck driver, crossing all through Europe. In 1945, Sonya married Peres and the two were among the founders of Kibbutz Alumot. Shortly after their marriage their eldest daughter Tzvia was born. Later the two had two other children – Yonatan and Nehemia. Sonya Peres observed the Jewish religion and maintained a kosher home. In the past it was reported she sought the blessing and advice of Rabbi Chaim Pinto and Yitzchak Kaduri on personal matters. Her friends said she volunteered for various causes away from the public eye. Throughout the years, Peres avoided the spotlight and rarely attended public functions. Shimon Peres respected her wish to stay away from the limelight. In recent years, since Shimon Peres moved into the President's Residence the two lived apart as Sonya preferred to remain in their Tel Aviv home. Last summer Shimon Peres discussed life away from his wife in an interview with Yedioth Ahronoth. "Yes, sometimes I do get very lonely," he said. Asked if he missed Sonya he replied, "Yes. The smell of home, her chicken soup. I miss her company. She was and is the love of my life." See all talkbacks "Sonya Peres dies at 87"